Young artist Taylor Swift has taken a big step in her musical career by taking an even bigger step back in time. 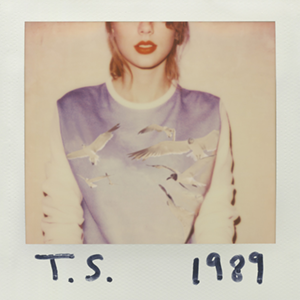 The singer-songwriter has recently released her fifth album 1989, and let me tell you, it’s full of surprises. Instead of feeling 22 as she did in her last album, the very eighties-pop sounds of 1989 clearly show that she’s feeling a little more 25 this time around. Over the past eight years, Taylor Swift has been gradually changing up her musical style. From 2006 until now, each album has been different from the last. Starting off with the self-titled Taylor Swift, the original country singer made her debut strictly within that genre. Her second and third albums, Fearless and Speak Now, still followed the country girl routine that she was well known for. It wasn’t until her last album, Red, where things got pop-y. Despite the changes in that album, she still made the effort to emphasize the country sound of an acoustic guitar. This latest album however, is a whole new ball game as she breaks away from these norms. Swift sets off the tone with claps and keyboard sounds in the song “Welcome to New York.” At first listen, you almost have to question if you grabbed the right CD because it is nowhere near typical T-Swift. With lyrics like “It’s a new soundtrack, I could dance to this beat forevermore,” it is the perfect introductory song to her new sound and style. Other tracks like “Style,” “I Wish You Would,” “You Are In Love,” and “New Romantics” have such strong a strong eighties influence that you very nearly forget what decade you’re in. Only two of out of her sixteen new songs feature her trademarked acoustic guitar. However, “How You Get the Girl,” and “This Love” don’t do it in a typical fashion. These songs feel a little more Taylor Swift-y, but still conform to this more electro-retro theme of the album. The shrewd artist also finds modern ways to revive a past genre of music. In her song “Wildest Dreams”, she mixes a bit of electro-pop with the slow cinematic sounds that a singer like Lana Del Rey is best known for. The album also includes the currently popular (and controversial) “Shake It Off”, along with her new single “Out of the Woods” which is rumored to be about ex-boyfriend and One Direction-er Harry Styles. Although T-Swift has switched up her sound quite a bit, her heartbroken hopeless romantic self still makes an appearance. Per usual, her songs talk about lost love, boys, and breakups. Swift has indeed stepped out of her comfort zone and taken some risks to create this album, and the feedback has been interesting. According to reviews on iTunes, many of her listeners feel that she has lost her sound, or say that they miss the old country Taylor Swift that they fell in love with, and some even claim to be wholly disappointed in the album. The pundits at Vulture. com feel similarly. They claim that the singer conforms too much to the sound of her musical peers when she should be trying to emphasize what makes her stand out from them. However, her rapid growth in sales might speak otherwise. According to Spin magazine, Swift is predicted to end a down period in album sales by retailing more copies of her new album in one week than any other CD this year. In addition to this, Forbes.com says that the young artist is well on her way to being the only one to make it platinum in 2014. With such a high success rate, it’s clear that she has many people interested in her ability to create something so invigorating, catchy, and original. It is clear that she has completely cut ties with the country music scene, trading in the acoustic sounds of a banjo and her good ol’ guitar for the experimental noises of a synth keyboard. However, these new sounds make it difficult to pinpoint who T-Swift is, or who she is trying to be. Whether 1989 can be classified as “eighties,” “electro,” or “modern,” it is clear that she has ditched her country roots and evolved into a full on pop star.